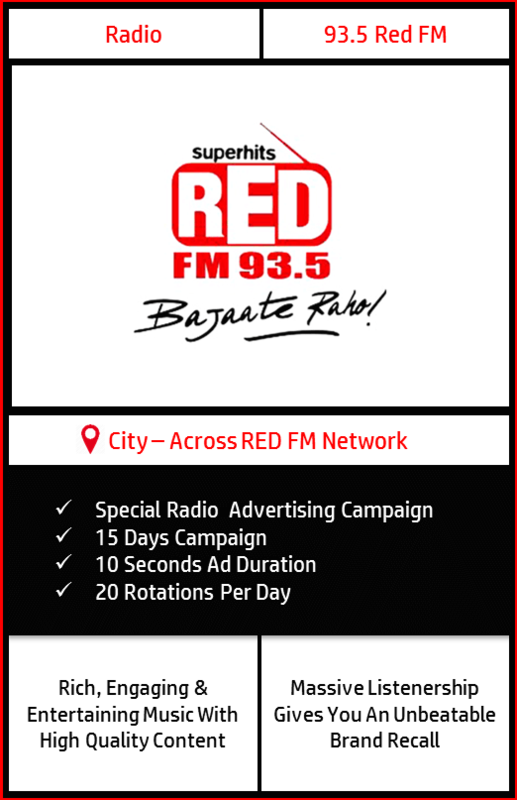 Now Advertising on Radio Channel 93.5 RED FM is easy & affordable! 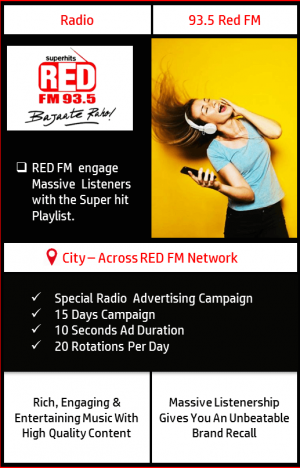 Request a Call Back and Get the Best Rates for an exclusive & customized Radio Advertising Package on 93.5 RED FM. Get extraordinary mileage with special value additions in the campaign. Get Your FM Radio Ad Absolutely Free Produced By World Class Quality Voice Over Artists. One of the Best & Highly Recommended Radio Station By Big Media Kart. Great ROI and Huge Brand Recall..!! Big Media Kart Provides The Best Ever FM Radio Advertising Rates in Industry. For details Click Here . Massive 20 rotations of 10 seconds each would be played per day consecutively for 15 days on 93.5 RED FM. After the end of the campaign within 30 days The Broadcasting report would be shared with the Client . Only Big Media Kart Produces and ensures you the Quality voice over radio ads. If required by the client BMK can change the advertisement within the tenure of the campaign. Slight deviations could be possible in the above plan with respect to inventory availability. The deviations if any would be intimated to the client at the time of booking of the package well in advance. The rates per second is different for each different city where RED FM is present. Once the client chooses the RED FM city to advertise, the best rates for advertising on 93.5 RED FM would be offered and the campaign would then be executed after the customized package is purchased. GST of 18% as applicable is extra across advertising on all RED FM Radio Stations Pan India. 93.5 RED FM India’s largest and most awarded Radio Network. With the best RJ’s and Super-hit music, Red FM promises & ensures pure entertainment to its listeners. Entertaining & Creative content is the unique selling point of RED FM which keeps the people engaged & stuck towards the channel and generate huge brand loyalty. Advertising through 93.5 Red FM is worth reliable and flexible which tends to provide customization in the package after analyzing the requirement of a particular brand. Wide network ensures your brand reaches to the Massive audience. Radio is all pervasive, be it the Place where you work, home, travel time etc. Hence it connects & entertains your target audience almost everywhere they go. Radio enhance your Brand Power by giving it a local touch. The local RJ’s are the replica of celebrities in their region & connects your target audience emotionally with their shows. Very Few Chances of Ad Avoidance in comparison to other medias. Plays a valuable support role as well & helps strengthen your campaign on other medias. Mass publicity: The major challenge faced by advertisers is Reaching Massive Audience. Radio ensures an Effective and Massive reach to the target audience. Quite flexible in nature and helps you to make customized On & Off ground integrated campaigns as per the brand requirements that enables a local as well as National reach for the Brand. Covers the Complete Country as well as a a Small Geography as per the requirements of Client.